Richard Thaler challenges the received economic wisdom by revealing many of the paradoxes that abound even in the most painstakingly constructed transactions. He presents literate, challenging, and often funny examples of such anomalies as why the winners at auctions are often the real losers—they pay too much and suffer the "winner's curse"—why gamblers bet on long shots at the end of a losing day, why shoppers will save on one appliance only to pass up the identical savings on another, and why sports fans who wouldn't pay more than $200 for a Super Bowl ticket wouldn't sell one they own for less than $400. He also demonstrates that markets do not always operate with the traplike efficiency we impute to them. This is a dense, academic book. It is nowhere as accessible as Thaler's other books. This book, however, is where it all started. It is an edited compilation of articles he wrote at the early end of his career. These themes are all repeated and referred back to - albeit in more digestible pieces - in his later books and even in Daniel Kahneman's "Thinking Fast and Slow. This book is a little heavy on the math, which I enjoyed at times but at other times felt really lost and not too eager to go look up the referenced journal articles for the full explanation on the formulas used. The other benefit of all the math is it makes all the points that Thaler raises in this book much more scientifically based. This book isn't pseudoscience. That said, it's not like this book is a math textbook. 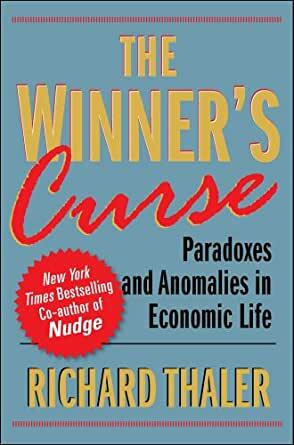 In the style of Freakonomics, (although the Winner's Curse was written about a decade earlier) Thaler just jumps from one cool behavioral economics example to the next. The thing from this book that stuck with me the most was the chapter on positive expected value lotteries. Apparently, they pop up every so often. Unfortunatley you need a billion dollar bankroll to take advantage of them, and I don't think Thaler included taxes when he was doing the expected value calculations, so they might not really exist at all. It gives you a great overview of some of the strange inconsitencies in human behavior. It is more than just a finance book and has many interesting stories that you can talk about with friends later. as an amateur economist grown increasingly dissatisfied w/ the failures of available theories, i was hopeful that this book would expound more on why markets fail. in some ways it did (in a very drab and boring language), although its coverage of financial markets (my interest) was all too brief and incomplete---the coverage of losers' outperformance of winners in equities was by far (IMHO) the best section of the book, but as good as that section was, the coverage of foreign exchange fluctuations was a failure. ---soros did a much better job of this. there is some good material in this book, and i would give it 3 stars as a result, but the writing style makes it simply too inaccessible for the average reader. better financial market focus can be found in "reminisces of a stock operator" and "alchemy of finance", which really were accidental breakthroughs in behavioral finance (particularly the former--a gem of a book). The "research" consists of gaming situations with very small groups, usually high school students with scenarios that do not begin to mimic real life economic decisions. Economics is a social science but this is not evident in this book which ignores the many social and psychological factors in consumer behavior. The text is so detached from reality that having read it you will be no better able to make financial decisions at any level or predict those of others. Better to spend time talking to commission sales people to gain insights into consumer behavior.